When cutting down waste in your home, you should also be trying to reuse the products you buy. When you buy milk cartons or any other food or drink that comes in a carton, you can easily reuse them when they are empty. This keeps you from throwing so many items away before you can really get your money’s worth out of them. Instead of buying more products, use your old milk cartons. You can use them for just about anything, both indoors and outdoors. Though the original purpose of the milk carton is to hold your milk when you are not using it, you can use it for so much more afterward. There are six main categories that we will focus on: gardening and wildlife, outdoor decorations, helpful indoor objects, organizers and storage, holiday decorations, and fun ideas for the kids. Each category has multiple ways that you can put your milk cartons to use. The gardening and wildlife category has ways that you can both grow plants and feed your local wildlife. The cartons you use can be either paper or plastic. Planters: Cartons are a great way to make DIY planters. One way to make one is to cut out one of the side panels of the carton. Fill it with dirt, and plant whatever you want in it. If you are starting a garden, place multiple cartons next to each other, each labeled by which fruit or vegetable you planted in it. This makes it easy to discern where you put each plant. Plant Pot: You can also create a cute pot or vase by cutting off the top of your milk carton. To make it more decorative, cover the carton in fabric or paint that matches your home decor. If you want it to be a hanging pot, just punch holes in the sides and run your rope or twine through it. 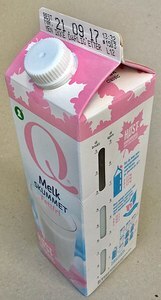 Watering Can: Making a watering can out of an old milk carton is probably the easiest way to reuse them. All you have to do is poke holes in the lid. That’s it! Fill the carton with water, and you are ready to water all of your plants. Birdhouses: There are multiple ways to make a birdhouse out of a milk carton. The easiest way is to cut out the sides of the carton and fill the bottom with bird seed. If you only cut out two opposing sides of the carton and leave them attached at the top, you can create a cute owl or bird out of your birdhouse. You can paint them and decorate them any way that you want. Just remember to attach a string to the top of it so you can hang it outside. Other than using your old milk cartons for gardening and making birdhouses, there are other uses for them outside. You can make decorative items as well. One easy way to decorate your backyard with cartons is to create lanterns. Just cut panels or windows in the carton. You can either leave it open or add a translucent material that softens the glow of the lights. Add battery-powered tea lights for individual lanterns or attach them to your solar-powered string lights! While there are plenty of ways to reuse milk cartons outside in your yard, there is even more you can do with them inside. You can make some helpful household items, which work especially well for your plastic milk jugs. Dustpan: You can make a quick and easy dustpan just from a plastic jug! All you have to do is cut out the side of the jug with the handle. This way, you can still hold your makeshift dustpan by the handle and use your broom to sweep the dirt onto the flat edge of the jug. Milk cartons also make easy organizers and storage for your small items around the house. There are several ways to cut them and make them work, so you decide what you want to do. Basket: If you have ever had small electronics plugged in to charge that keeps getting pulled out or knocked over, this basket is for you. Just cut your plastic milk carton in half, leaving enough on the top half to cut out handles. You will want to make the handle large enough that your prongs on your phone’s charger will fit through but small enough that the entire plug does not fit through it. Next, attach the handles with hot glue, super glue, or any other sticky substance. (Duct tape works fine as well.) Then, you plug your phone in and your charge will pin one of the handles of the basket against the wall. You can then set your phone in the basket without worrying that it will get knocked around. Desk Organizer: These are great for organizing art supplies like pens, pencils, scissors, colored pencils, markers, and etc. You can cut the carton in half horizontally and decorate the container with paper, fabric, or paint. Alternatively, you can cut out the side of the carton opposite of the one with the handle. If you run a small pole through the handles of the cartons, you have quick storage that you can hang next to a desk or craft table. It is never too early to get started on the holiday decorations, right? You could also just stash your milk cartons in storage until you are ready to think about the holidays. When you are ready, there are several holiday decorations you can make with old milk jugs and cartons. Besides, who wants to go spend money on overpriced decorations when you can easily make your own for free? Halloween: It is never too early to get started on the holiday decorations, right? You could also just stash your milk cartons in storage until you are ready to think about the holidays. When you are ready, there are several holiday decorations you can make with old milk jugs and cartons. Besides, who wants to go spend money on overpriced decorations when you can easily make your own for free? Christmas: Just like Halloween, Christmas activities can get messy, like when you make gingerbread houses. Sometimes your gingerbread house may not even be able to stand on its own. (At least, that is how mine always ends up.) To make a gorgeous gingerbread house that will not come crashing down on you, use a milk carton. Paint it brown and recycle other materials around your house for the decorations. For example, you can use scrap paper to make windows, and buttons to decorate the roof. You can also use this house year after year, unlike an edible gingerbread house. There are also several crafts that you can make either with your kids or for your kids. You can make toys, decorations, and many more. Check out these neat crafts and give them a try! One easy craft to make is a simple sailboat. Start by cutting your milk carton in half lengthwise. If you are using a paper milk carton, you will want to use duct tape or something else to waterproof the boat. Use a popsicle stick or other straight material to create a mast for your sail. Use leftover material from the carton or paper to make a sail. After that, you are ready for the water! If your child loves legos, you can make some great lego decorations with milk cartons. This works especially well for paper cartons because they are blocky with sharp edges. Using old plastic caps, glue them to one side of the carton to mimic the look of a lego. To finish, paint it whatever color you want. Similar to the gingerbread houses, you can also make toy houses with your kids using other scrap materials. With multiple cartons, your children can have a whole village to play with. You can even cut out three sides of a door so it actually opens and closes. There are so many things you can do with old milk cartons, whether it be for decorations or usefulness around the house. There are even great crafts your children can enjoy! This is great for the environment because you cut down on waste and reuse the materials you buy. It also saves you money in the long run because you do not have to buy other materials.